Identify, document and prioritize potential PCB sources within a sanitary sewer system. Brownfield Science & Technology, Inc. (BSTI) was hired to assist with the identification of sources of PCB within the service area of a large sanitary sewer network. This work was conducted as part of a cooperative effort between county and municipal governments to reduce the discharge of PCBs from a waste water treatment plant under an existing Pollution Minimization Plan (PMP) associated with a NPDES permit. 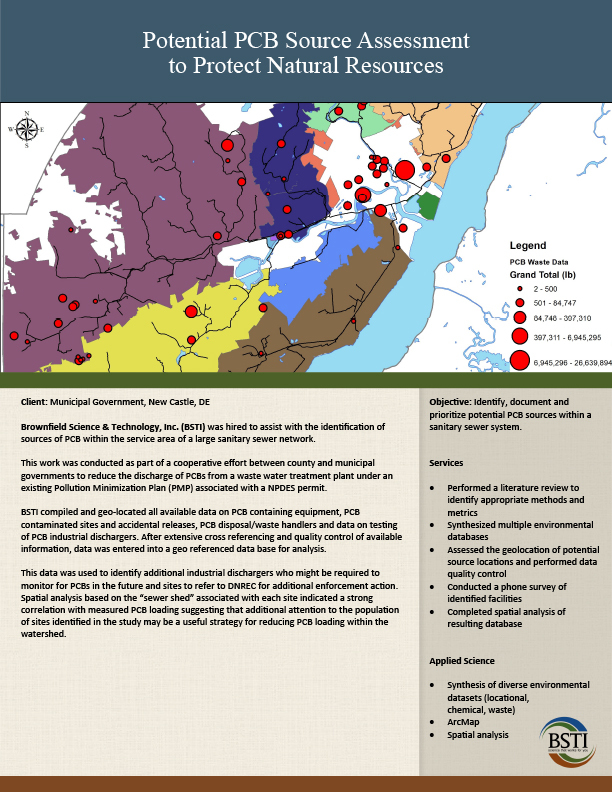 BSTI compiled and geo-located all available data on PCB containing equipment, PCB contaminated sites and accidental releases, PCB disposal/waste handlers and data on testing of PCB industrial dischargers. After extensive cross referencing and quality control of available information, data was entered into a geo referenced data base for analysis. This data was used to identify additional industrial dischargers who might be required to monitor for PCBs in the future and sites to refer to DNREC for additional enforcement action. Spatial analysis based on the “sewer shed” associated with each site indicated a strong correlation with measured PCB loading suggesting that additional attention to the population of sites identified in the study may be a useful strategy for reducing PCB loading within the watershed.